Click on the "View Guide" button below to download and view your FREE guide. The information herein has been prepared for educational purposes only and does not constitute an offer to purchase or sell securitized real estate investments. Such offers are only made through the sponsors Private Placement Memorandum (PPM) which is solely available to accredited investors and accredited entities. 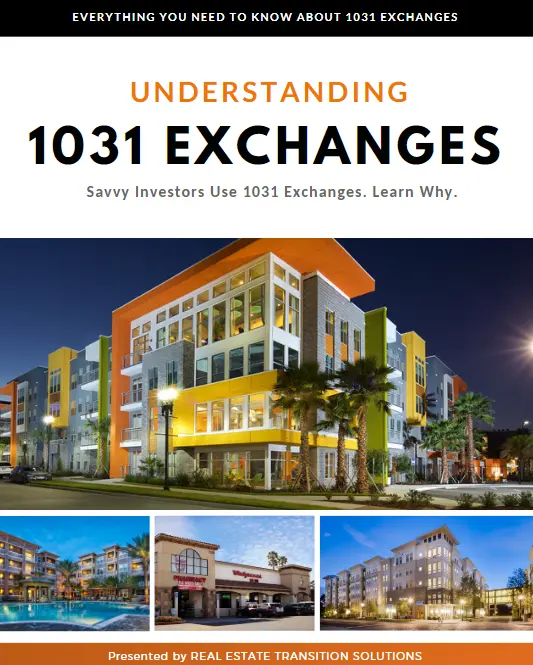 DST 1031 properties are only available to accredited investors (generally described as having a net worth of over $1 million dollars exclusive of primary residence) and accredited entities only. If you are unsure if you are an accredited investor and/or an accredited entity please verify with your CPA and Attorney. There are risks associated with investing in real estate and Delaware Statutory Trust (DST) properties including, but not limited to, loss of entire investment principal, declining market values, tenant vacancies and illiquidity. Potential cash flows/returns/appreciation are not guaranteed and could be lower than anticipated. Diversification does not guarantee profits or guarantee protection against losses. Because investors situations and objectives vary this information is not intended to indicate suitability for any particular investor. This material is not to be interpreted as tax or legal advice. Please speak with your own tax and legal advisors for advice/guidance regarding your particular situation. Securities offered through Concorde Investment Services, LLC (CIS), member FINRA/SIPC. Advisory services through Concorde Asset Management, LLC (CAM), an SEC registered investment adviser. Real Estate Transition Solutions is independent of CIS and CAM.